You are here: Home / Automation / How to VMFork aka Instant Clone Nested ESXi? The VMware Fling's team recently released an update to the existing PowerCLI Extensions which now exposes the new VMFork aka Instant Clone capability that was introduced in vSphere 6.0. The Fling contains a set of PowerCLI Extension Modules which in turn provides new PowerCLI cmdlets for accessing the Instant Clone feature. The idea behind the Fling is to help VMware understand how customers would like to consume the Instant Clone feature not only from a CLI point of view but also from an API and UI standpoint. Prior to this, Instant Clone was only available through the use of either Horizon View or the Big Data Extensions product. I think this is a great opportunity for customers and partners to help shape how Instant Clone should be consumed more generally. One of the use cases I had in my mind when I had first heard about the Instant Clone feature was to be able to quickly instantiate new Nested ESXi VMs. When I got the opportunity to help test out early prototypes of the Instant Clone cmdlet to help provide feedback and usability improvements, I knew I had to give Nested ESXi a try! Note: For Instant Cloning regular OSes, only step 2 and 3 are really needed. Due to a known issue with VMware Tools for Nested ESXi, I have found that it is easier to prepare the Nested ESXi VM prior to quiescing and creating Instant Clones from the Parent VM. Step 1 - Download and install both PowerCLI 6.0 Release 1 & Instant Clone PowerCLI Extensions Fling. Step 2 - Perform a fresh Nested ESXi 6.0 installation in a VM, do not configure additional settings outside of enabling ESXi Shell and SSH. Note: For out of the box use, the only script that needs to be modified is the PowerCLI "vmfork-esxi60.ps1" script, the rest of the scripts should work or require very little to no modifications assuming you have followed the instruction thus far. 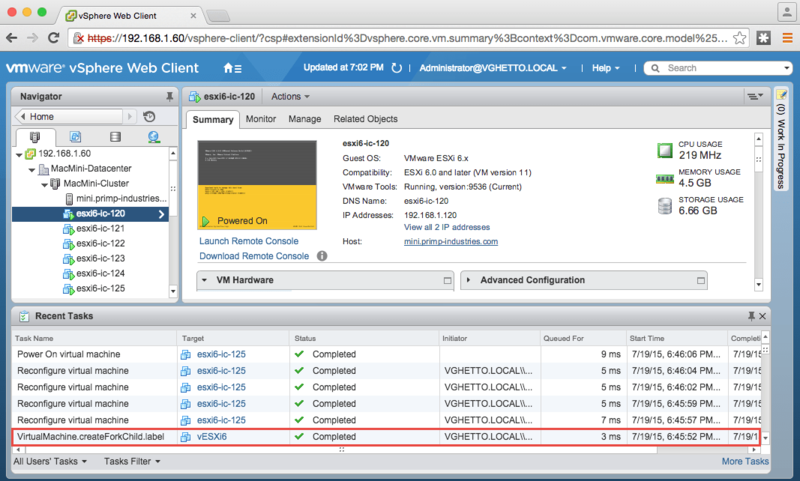 Step 4 - Upload the prep-esxi60.sh to Nested ESXi 6.0 VM (Parent VM) and then execute it using either the ESXi Shell over SSH or through a VMRC session. If you use SSH, you will notice that the script hangs, that is because the VMkernel interface is deleted as part of the script. The section shown below will also need to be edited which contains the customization properties which are then passed down to the guestOS for configuration as part of the Instant Clone process. If everything was successful, you should see a couple of new powered on Instant Cloned Nested ESXi VMs that have been fully customized and ready for use! Note: There have been a couple of times where newly Instant Clone VMs have not been properly customized and when looking in the Instant Clone logs under /var/tmp/quiesce.log you may find "Unable to fork" error message. I usually have to re-quiesce the Parent VM which I do so by reverting back to a snapshot that captures the state after Step 4. Once I re-run the PowerCLI script, I am able to successfully deploy N-Number of Instant Clone Nested ESXi VMs. For additional best practices and tips/tricks, be sure to check out this blog post here. Big thanks to Jim Mattson for some of his earlier research and work on this topic which made implementing these scripts much easier. Thanks you for sharing this awesome news. I was wondering if this method can be applied to instantly clone a vCenter, NSX manager or vShield manager with several esxi hosts (essentially I want to be able to clone the whole setup to multiple dev and qa group so that they don’t have to spent time setup the environment). Example: on vlan 100 I have a vCenter, vShield manager register with vCenter, and several esxi hosts added to vCenter, and I want to clones all these vm to vlan 200, 300, etc. (in the child clone setup I don’t need to modify the IP address of any vm because all the vm will be on a separate vlan 200, 300, etc.). Do you know if there any limitation in what guest vm can be enable as instant clone vm, because I have no problem setup an instant clone of a vCenter server and virtual esxi host, but I am having trouble enable instant clone on the nsx manager guest vm. The issue that I suspect with the NSX Manager is that when you login, you’re not placed in a regular shell which is required as vmtoolsd is called to actually enable the “Quiesce” operation. As you probably know when you login to NSX Manager, you’re dropped into a limited shell which doesn’t have access and I suspect this is the issue. However, I still not able to enable instant clone on the nsx vm. Yea, I’m not sure then. It’s possible that the version of VMware Tools may not work with Instant Clone. Maybe I should get the team to blog what they are doing. Just out of curiosity, how does any Horizon product leverage the instant clone feature? I didn’t see anything new that would indicate new instant cloning capabilities in Horizon suite of products. I ran into an issue while trying to go crazy with vmfork. I’m getting errors about maximum vcpu limits and not sure how to bypass. Maximum virtual machines limit reached: 19 (32768 worlds). An error was received from the ESX host while powering on VM UbuntuClone190. Could not power on virtual machine: Number of running VCPUs limit exceeded. So I did some more reading and found another blog that mentioned changing the maxvCPUsPerCore & maxvms values (https://deangrant.wordpress.com/2015/01/11/configuring-esxi-host-maximum-number-of-vcpus-on-a-single-core-and-virtual-machines-per-host/) After changing those and rebooting the nested ESXi 6.0 host it’s stuck on booting at the sfcbd-watchdog service. So I might have to rebuild my nested ESXi VM’s, but aside from that though. Do you have any idea how to get more VM’s per host and bypass any of the safeguards that may be limiting it? Enable-InstantCloneVM : 9/21/2017 5:19:20 PM Enable-InstantCloneVM Enable instant clone failed for vm xxxxxx. The in-guest quisce operation ‘/bin/ash -c “. /var/tmp/pre-esxi60.sh; export LD_LIBRARY_PATH=$LD_LIBRARY_PATH:/usr/lib/vmware/vmtools/lib; export PATH=$PATH:/usr/lib/vmware/vmtools/bin; vmtoolsd –cmd \”vmfork-begin -1 -1\”; . /var/tmp/post-esxi60.sh;” > /var/tmp/quiesce.log 2>&1’ didn’tquiesce the VM. You have reached the maximum number of connected consoles: 40. Please contact your administrator. and I can’t get into the console at all. Any ideas? Thanks ahead of time. I figured it out. Both the pre and post scripts had hidden windows carriage returns when I initially copy/pasted the text. I had to convert the files to unix based end of lines before running the powershell script. I’m honestly surprised no one else has had that issue.